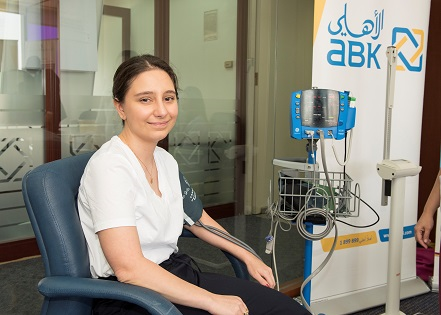 Al Ahli Bank of Kuwait (ABK) employees recently received free medical testing during a visit made by a medical team from Royale Hayat Hospital to the Bank’s Head Office on Monday 30 May, 2016. The employees received a group of free tests, which included blood sugar levels, Body Mass Index (BMI), blood pressure, pulse count and temperature. Health packages from the Royal Hayat were also distributed to the employees. The visit made by the Royal Hayat Hospital to ABK is in line with the Banks aim to raise health awareness among its staff members. The Bank firmly believes that a healthy mind and body leads to a healthy work atmosphere.